A family embark on an exciting adventure to find a bear. On their journey, the family encounter many different terrains. They slide down a grassy slope, splash through a deep cold river, sludge through thick oozy mud, stumble through a deep dark forest, and walk through a swirling snowstorm. The family eventually reach a narrow, gloomy cave where they come face to face with a bear, who chases them all the way back home. 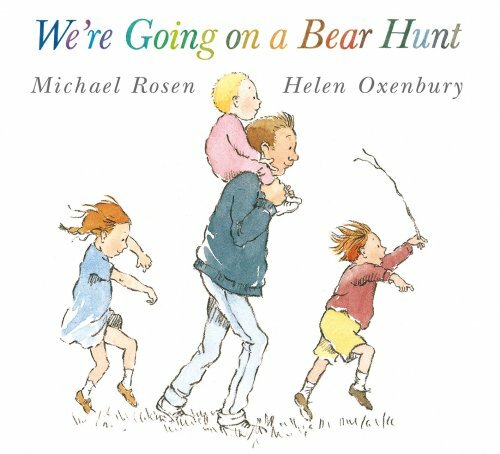 We’re Going on a Bear Hunt is a classic, light-hearted story that is a staple in many classrooms and therapy rooms. The repetitive patterns encourages children to join in, and the simple story line makes it the perfect choice for working on children’s sequencing and narrative retelling skills. Basic descriptive language is modelled throughout the story, allowing children to improve their story retells through the use of adjectives. For further speech and language targets in ‘We’re Going on a Bear Hunt’, see the list below.